11 websites with free audiobooks. 11 mugs for scifi/fantasy readers. “The 20 happiest states in America“. Sheet pan sweet potatoes and black bean hash. Sheet pan honey-sesame tofu and green beans. Cheesy lentil, mushroom, and rice bake. 21 inexpensive recipes with rice. Chocolate chip cookies, with your choice of four different gluten-free flours. “[M]ath concepts explained by knitting and crochet“. There was much more to the Diva’s performance in The Fifth Element – now you can see (and hear) it all! A really excellent short Harry Potter story that would’ve ended the series much, much sooner. A mobile game where you just pet animals’ fur. Definitely deflate your giant inflatable moon if there’s a typhoon in the forecast. Huge, dynamic e-ink screens on semi trucks won’t be distracting at all, I’m sure. “Artist builds working swing on a BART train.” Um. State fair-themed restaurant to be added to a Walmart in Texas. There’s a You Tube channel where you can watch paint dry. A possibly NSFW Cake Wrecks. Lynx and babies! Baby red panda! 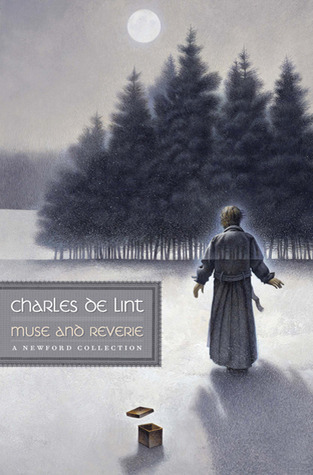 Muse and Reverie by Charles de Lint. Another solid collection of Newford short stories, set before Widdershins. 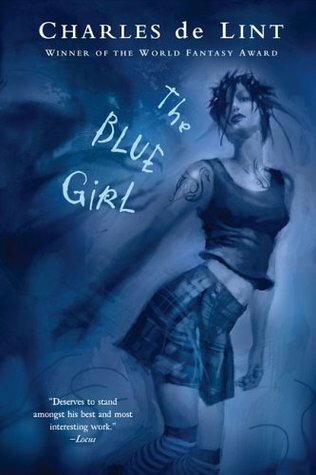 The Blue Girl by Charles de Lint. I’m not a big YA fan, even for a Newford book. It wasn’t a bad book! And I did enjoy the tiny cameos and mentions of a few of the established Newford folks. Posted by Chris on Friday, September 16th, 2016, at 2:00 am, and filed under Linkity linkity link, Reading, Reviewettes. I’m sorry, that octopus bag is just creepy. REally creepy. But I’ll put a lavender maze on my to visit list. Chris- Ouch. I’ve had a few removed and it’s painful. I noticed that “men” products are cheaper, why is that? A recent post from lorraine..Ten On Tuesday- Quiche, Lorraine? Also, I hope everything is only “suspicious looking” and not any more ominous than that. Hope you get a chance to nap with the kittehs! Hope all is well with the moles. Paint drying under a microscope is a surprise. re disappearing words. Counterpin is clearly a variant of counterpane, so I’m surprised it’s disappearing. Do y’all generally not use that to mean a lightly quilted decorative cover that goes over all the sheets and blankets and pillows on a bed? If not, what do you call the outermost layer of a bed? Hope those moles end up being very boring. Hmmpf. That fur petting app would be a total disappointment compared to the soft floofieness of your real kitties. I am glad to hear MN rates highly on the happiness scale. I like it a lot!